It has become common in our hurried world for many people to accept the philosophy “Don’t sweat the small things!” as their solution for many of life’s little inconveniences. While this may be true when it comes to things like parking tickets and missed phone calls the philosophy is not applicable when it comes to livestock production and feed quality. If you are a swine or poultry producer one small thing can prove devastating and turn a profitable operation into a financial disaster. That small thing is the presence of mycotoxins in your feed. And small is no understatement with concentrations of some mycotoxins at parts per billion levels being sufficient to have a deleterious effect. Being concerned about the presence of mycotoxins is somewhat baseless without a fundamental understanding of what a mycotoxin is and where it comes from. Having this knowledge will then allow you to create a mycotoxin management plan to minimize the risk associated with your farming operation. Mycotoxins are a by-product of mould growth. Mycotoxins are secondary fungal metabolites or more simply, a toxic chemical compound produced by moulds. In fact, mycotoxins could be considered mould excrement! When mycotoxins are consumed by either livestock or humans the results can include illness or changes in behaviour. While mycotoxins are typically present and can be problematic at extremely low levels one of the greatest concerns revolves around the fact that they can be present in feed ingredients that are used in large volumes by a very large and potentially diverse livestock population. For example grain crops like wheat, corn and barley can be infected with mycotoxins and be fed in relatively large quantities to a geographically diverse swine population. Mycotoxins are produced under varied environmental conditions. Different fungi produce mycotoxins under completely different conditions. Mycotoxin infection begins early on when the plant is growing. The nature of the growing season can affect which variety of mycotoxin is produced. Hot and very dry growing conditions favour the production of aflatoxin producing moulds whereas cooler wet conditions promote Fusarium type growth and the production of deoxynivalenol (DON) or vomitoxin. In Canada we are most familiar with the presence of fusarium compounds and on a worldwide basis Fusarium mycotoxins are the most common. The presence of mycotoxin producing fungi can be exacerbated by bad weather at the time a crop is harvested. Excessive moisture while the grain is in the swath can increase fungal growth and the potential for mycotoxin production. Poor quality grain with high levels of dockage and damaged kernels also tends to have a higher potential for contamination. In many cases the toxic compounds actually are concentrated in the dockage and a good cleaning of the grain can significantly decrease the potential for problems to develop. Unfortunately contamination can continue after the crop has been placed into storage. While some varieties of toxins are produced by fungal parasites as the grain is still standing in the field there exists another class of mycotoxins called “storage mycotoxins” produced by less pathogenic strains of fungi like the mould that produces ochratoxin A. These fungi flourish when grain is placed into storage in a damp or “tough” condition. Grain placed into storage with a moisture content over 15% is very susceptible to this type of damage. Obviously signs of infection such as discoloured kernels, visible signs of mould and caking of the grain into lumps are a strong indication of a potential problem and grain showing these qualities should be avoided if at all possible. The presence of visible contamination cannot be relied upon as the basis for a mycotoxin management plan. A low fungal infection level can result in a high concentration of toxic mycotoxins. In fact simply testing for the presence of a live fungal component cannot rule out the presence of a potentially dangerous level of toxin. Mycotoxins are an end product of fungal activity. The toxic mycotoxin may be present months or even years after the fungus has died or deliberately been killed to limit further exposure. The only sure way to establish the presence of a mycotoxin is by conducting a chemical test. 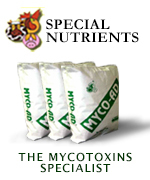 A disease condition caused by the ingestion of a mycotoxin is referred to as “mycotoxicosis”. Different species of livestock respond to mycotoxin poisoning in different ways. Generally speaking the clinical signs of mycotoxin ingestion have been well documented. Known effects from the ingestion of moderate to high amounts range from death to reduced growth rates and impaired reproductive efficiency. Chronic low level ingestion may result in reduced immune responses and an overall reduction in disease resistance. It has been observed that livestock ingesting levels of mycotoxins far below those that are recognized to result in overt toxicity often have some degree of immunosuppression. These effects of low level exposure may indeed be the most important and overlooked aspect of mycotoxicosis. When an incidence of acute exposure occurs the effects are severe and dramatic. Livestock may die, go off feed or suffer significant declines in reproductive performance. In the case of swine acute exposure to the Fusarium mycotoxin DON (vomitoxin) causes very visible feed refusal and vomiting. In the case of chronic exposure the signs may be less obvious. A slowing of growth rate accompanied by a decrease in feed consumption or a general reduction in health status caused by a compromised immune system may not be readily apparent or easy to diagnose. This low level response to a chronic mycotoxin load can cost producers a significant amount of money without setting off alarms and instigating an investigation of the herds or flocks health status. Therefore the most effective offence against mycotoxicosis is a good defence. It is necessary to “sweat the small things”. Obviously the best defence is to never buy anything that may be fungally contaminated. The reality is that this is impossible. Moulds are endemic through out the world and procuring large quantities of feedstuffs that are mould free is impossible. After accepting the fact that there is a constant underlying potential for a problem is necessary to develop your mycotoxin management plan. Mycotoxins can be controlled by various means. The simplest method is dilution. Mixing clean grain with contaminated product may reduce the overall mycotoxin load and the potential harm to the animal being fed. Regrettably the distribution of fungal toxins in feedstuffs is not uniform and there may be mycotoxin “hotspots” that are not sufficiently diluted and still cause problems. Because the toxin is often concentrated in the dockage portion of the grain a second relatively simple method of risk management is to thoroughly clean the grain before using it and disposing of the screenings. Another method of control is through the addition of a binding agent like sodium bentonite. The addition of a clay product with a strong electronic charge may reduce the effects of the mycotoxin by binding it to the absorptive surface of the clay. This is a relatively inexpensive proposition however clays have a low specificity for mycotoxins and must be included at relatively high rates. There are several disadvantages to this method including the dilution factor that results from the addition of large quantities of clay to a finished feed. In addition the clay has no nutritive value and passes through the GI tract and increases faecal volume. Certain feedstuffs like dehydrated alfalfa have also been shown to bind mycotoxins but the required addition rates are not feasible in today’s high energy diets. Chemical binders in the form of synthetic inorganic polymers have been developed but they are typically specific to one type of mycotoxin and not very effective when presented with an array of naturally occurring compounds. The answer to everyday mycotoxin control lies in another very small thing. Yeast! The latest innovation in the battle against mycotoxicosis is the use of organic polymers derived from the walls of yeast organisms. These yeast cell wall extracts are high in mannanoligosaccharides (MOS) and have a very high effective surface area relative to weight. Coupled with a natural specificity that allows significant mycotoxin binding at very low inclusion rates this is becoming the method of choice for long term mycotoxin control. The everyday use of organic polymers derived from yeast cell walls is not one of those “coming soon” or “watch for further news” type concepts. You can ensure the safety of your livestock or poultry now by adding “Integral” from Alltech Biotechnology Inc. Canadian research conducted under the direction of Dr. Trevor Smith of the University of Guelph has verified the effectiveness of “Integral” in mitigating the effects of Fusarium mycotoxicosis in both swine and poultry. Dr. Smith’s research demonstrated that including 0.2% (2 kilograms per tonne) of “Integral” in broiler feed overcame an observed depression in broiler growth rate and also reversed a commonly observed discoloration of breast meat caused by a high intake of Fusarium contaminated grains. Research with young turkeys demonstrated that birds fed “Integral” grew significantly faster than unsupplemented birds receiving the same mycotoxin contaminated grains. Feeding trials with starter pigs fed contaminated grains revealed that supplementation with 0.20% “Integral” prevented depression in liver weight and also prevented changes in brain neurochemistry associated with the consumption of mycotoxins. The chemicals affected by the supplementation of “Integral” are believed to be involved with loss of appetite, lethargy and loss of muscle co-ordination. Research has shown that with the right mycotoxin management plan in place it may actually be possible to “not sweat the small stuff”. By incorporating “Integral” from Alltech Biotechnology Inc. into your feeding program you can rest easy and enjoy the big things in life.